There are a lot of endearing things about my kitchen. It has tinned ceilings original to the house from the early 1900s, it gets beautiful light, it's very large by New York City standards. But there are a lot of things I hate about it. It's old with largely unreliable appliances, its counters are covered with a horrible off-white laminate littered with coffee stains, it has a freezer that doesn't freeze when I'm trying to make ice cream sandwiches. But it's my kitchen, and I'll always love it even if I don't like it. 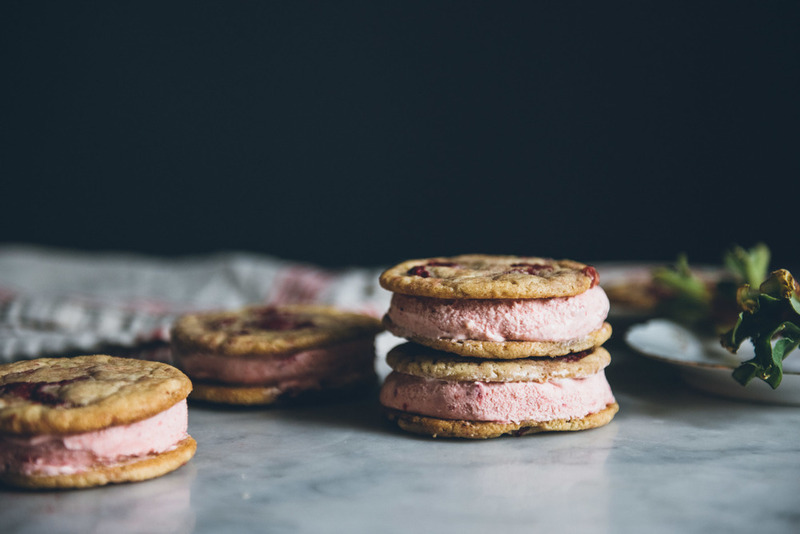 Ice cream sandwiches have been on my list of to-do recipes for a while, so when strawberry rhubarb season rolled around I thought they would make the perfect flavors for a fresh, cold, summery treat. The biggest challenge with this recipe was finding the ideal cookie. I wanted it to burst with strawberry flavor, but also for it to be a good home for some fruity and tangy ice cream. Strawberries have a high water content, and most cookies that contain any amount of extra liquid end up being cakey, more like muffin tops than cookies, which are no good here. This cookie needed to be crispy on the outside, chewy on the inside, and relatively flat since we're using two for each sandwich. My solution to this conundrum was to partially dehydrate the strawberries in the oven beforehand, freeze them, then use them like chocolate chips! It worked swimmingly. With each bite of cookie, you get an injection of bright, concentrated strawberry flavor. The cookie is then paired with a simple strawberry rhubarb ice cream. It's tart from the rhubarb, fragrant from the strawberries, and has just the right amount of sweetness. It's also super simple to make so if you're not up for making both portions of this recipe (though I hope you do! ), you can most assuredly try the ice cream on its own. Depending on how large your ice cream maker is, you might have to churn in two batches. Plan ahead if necessary. As always, I am a huge proponent of weight over volume in baking (especially when it comes to measuring flour! ), therefore I've provided gram equivalents for the ingredients I usually weigh. The baking time specified is for a slightly underbaked cookie, so they'll remain chewy when frozen. Increase the time by a few minutes if you want a crunchier cookie. - Day one: Partially dehydrate the strawberries for the cookie dough. Make the ice cream base, chill, and churn. Place everything in the freezer to firm up for tomorrow. - Day two: Make the cookies, freeze the cookies, and assemble. Makes 14 ice cream sandwiches. In a saucepan over medium heat, add rhubarb, water, and 3/4 cup of sugar. Bring the mixture to a simmer, stirring occasionally until the rhubarb is fully cooked and starting to fall apart, about 10 minutes. Let cool for 20 to 30 minutes. In the meantime, place strawberries in a large mixing bowl and sprinkle with remaining 1/4 cup sugar. Toss to coat and let sit for 10 minutes. Once the strawberries have started releasing their liquids, mash them up with a fork or potato masher until only small pieces remain. Place the rhubarb in a blender (add half the strawberries if you want a smoother ice cream, leave them out if you want more visible pieces), and blend until smooth. Transfer rhubarb puree to the large mixing bowl with the strawberries. Add cream, milk, and vodka/gin. Stir until smooth and no streaks remain. Transfer to an airtight container and chill in the fridge for at least 4 hours. Churn according to your ice cream maker's instructions then transfer to a container, cover, and freeze until firm (preferably overnight). Turn the oven to 225 degrees F. Place the sliced strawberries in one even layer on a large parchment paper lined baking sheet. Roast for 2 & 1/2 to 4 hours or until mostly dehydrated. Note that baking time can vary wildly depending on how large your strawberries are to begin with and how precisely you sliced them, thus I recommend checking them every 45 minutes or so and pulling them out when they are about 60-75% dried but still pliable. Once cooled, peel the strawberries off the parchment paper and return them to the baking sheet in one layer. Cover and place in freezer until completely frozen. Add flour, baking powder, baking soda, and salt to a large mixing bowl. Whisk to combine. In the bowl of a stand mixer fitted with the paddle attachement, beat butter, granulated sugar, and brown sugar on medium high speed until light and fluffy, about 5 minutes. Scrape down the bowl, then add eggs and vanilla. Beat for another minute. Add the dry ingredients in two batches, each time scraping down the bowl and mixing until just combined. Remove the bowl from the mixer and add strawberries. Fold into the dough using a spatula. Split the dough in half, wrap each portion tightly in plastic wrap, and chill for at least one hour and up to a day. Preheat oven to 350 degrees F. Scoop out 1.5 oz portions of dough, shape into a ball with your hands, and place on a parchment paper lined baking sheet with at least 2 inches of space between each portion. Bake for 12 to 13 minutes until the edges are just beginning to brown and the middle is still light in color (this is for a light colored baking sheet, reduce the baking time as needed if you are using a darker baking sheet). Let the cookies cool to room temperature then place them in the freezer to firm up for 1 hour. Place one scoop of ice cream in between two cookies and give it a light squish with your fingers to distribute the ice cream evenly. Once you have finished assembling, place ice cream sandwiches back into the freezer for 2 hours. Enjoy right away or wrap them up individually for later.